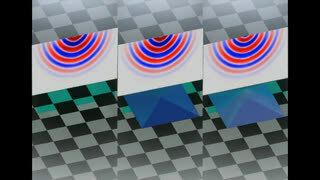 (Phys.org) —Using little more than a few perforated sheets of plastic and a staggering amount of number crunching, Duke engineers have demonstrated the world's first three-dimensional acoustic cloak. The new device reroutes sound waves to create the impression that both the cloak and anything beneath it are not there. 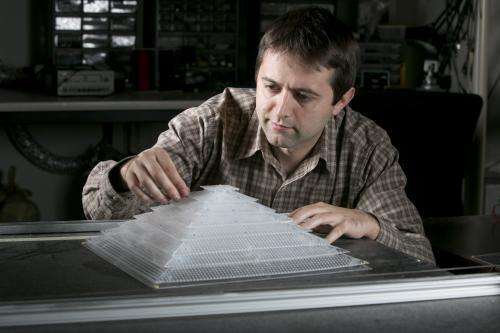 To achieve this new trick, Cummer and his colleagues turned to the developing field of metamaterials—the combination of natural materials in repeating patterns to achieve unnatural properties. In the case of the new acoustic cloak, the materials manipulating the behavior of sound waves are simply plastic and air. 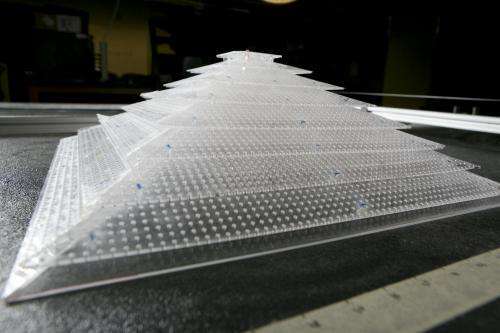 Once constructed, the device looks like several plastic plates with a repeating pattern of holes poked through them stacked on top of one another to form a sort of pyramid. "We conducted our tests in the air, but sound waves behave similarly underwater, so one obvious potential use is sonar avoidance," said Cummer. "But there's also the design of auditoriums or concert halls—any space where you need to control the acoustics. If you had to put a beam somewhere for structural reasons that was going to mess up the sound, perhaps you could fix the acoustics by cloaking it." Maxwell Smart finally will be pleased.